I loveeee Instagram, but lets face it, it can be a minefield at times to navigate and find accounts that really resonate with you. Over the past year or so I’ve been lucky enough to come across these wonderful accounts and can now call some of these wonderful ladies my friend. Feel free to share the accounts you love to follow in the comments section to! Dr Jen Cohen – Jen is based in Australia and mum to two boys. Her speciality is fussy eaters and shares her real life struggles with her own children’s eating. Jen also blogs, does periodic amazing facebook lives and runs a wonderful online course. Wholesome Child – Mandy is a paediatric nutritionalist based in Australia and mum to two. Mandy shares gorgeous tips and recipes with beautiful photos. 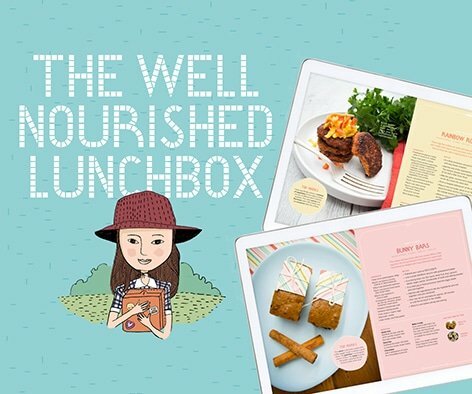 Mandy has recently published an amazing book called ‘Wholesome Child: A complete nutrition guide and cookbook’, she also holds periodic workshops around Sydney. Veggies and Virtue is jam packed full of tips and you can score some free weekly meal plans! Motherhood and Meals – Noelle is a registered Dietitian based in Canada and Mum to three gorgeous boys. Noelle’s account is jam packed full of helpful tips and recipes, from her #toddlertuesday tips to her #fitnessfriday you’ll sure to find something of interest! Nutrition by Gina Rose – Gina is a clinical nutritionist, mum to three and based in New Zealand. Gina’s area of expertise is in women’s health, fertility and infant nutrition. Amongst her beautiful images she often shares gorgeous recipes and lots of healthy tips. The Nutrition Guru and Chef – Tara is a Nutritionalist (and Jeff is a Chef), mum to one and based in Australia. Tara has a wonderful no nonsense style of speaking and sharing information. She has really fab facebook lives with her adorable daughter and shares yummy recipes. Veggies and Virtue – Ashley is a paediatric dietitian based in the USA and mum to two. Ashley’s account is lovely and colourful, with lots of tips and hacks. She’s also big on meal planning and if you sign-up to her mailing list she is sending out weekly menu plans which are family friendly and geared towards picky eaters. Kids eat in colour – Jennifer is a registered dietician and mum to two based in the USA. Jennifer has a beautiful and colourful account with Tuesday – Thursday exposure tips and tricks and Fridays are all about food battles. I’m loving her latest videos and challenge #kidseatincolor where she videos her children eating certain fruit or vegetables. The idea is that we show this video to our children, then later in the week serve it to them to see if they will try it! Live Love Nourish Aus – Casey-Lee is a nutritionist and mum to one based in Australia. Casey-Lee’s account is jam packed full of delicious and healthy recipes (all gluten, dairy and refined sugar-free) as well as sharing lovely giveaways from time to time. Feeding Littles – Megan is a dietician and Judy is an OT feeding therapist and between them have four children based in the USA. Their Instagram has heaps of tips, presented in a very clear and visual manner, recipes and lots of funny quotes mixed throughout. Live Love Nourish has the most gorgeous account. Disclosure: This post contains affiliate links. I receive a small commission at no cost to you when you make a purchase using my link.